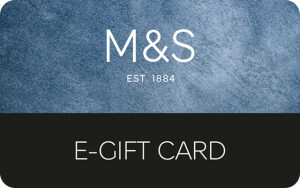 This e-gift card can only be redeemed at Marks & Spencer stores in the United Kingdom and Channel Islands (inc Outlets but excl BP stores) and online subject to terms and conditions. It may be exchanged for goods of a higher price than the face value of the e-gift card on payment of the difference. If any product purchased with an e-gift card is subsequently exchanged for a product of a lower price or a refund, any money owing will be added to the remaining balance on the e-gift card. This e-gift card cannot be exchanged for cash or used to pay for M&S Money services, products or outstanding card balances, made to measure shirts, cosmetic appliances, personalised cards or M&S Energy. If you do not spend the entire balance on the e-gift card the remaining balance will be updated after each transaction and shown on your printed till receipt in store. This e-gift card has a maximum value limit of £1000. This e-gift card can be topped up to the maximum value limit. This e-gift card will be valid for 12 months from the last transaction (transactions include balance enquiries). Any remaining balance will be cancelled on expiry of the validity period. Please check in store or online for balance enquiries or contact us by phone (local rates apply) on 0333 014 8777. Please treat this e-gift card as cash. Marks & Spencer will not accept liability for lost, stolen or damaged e-gift cards. Marks & Spencer reserves the right to amend the terms and conditions of the e-gift card at any time and to take appropriate action, including the cancellation of the e-gift card if at its discretion it deems such action necessary. This does not affect your legal rights. A fail-proof gift idea for those tricky to buy for friends. Treat your loved ones with a gift card ready to spend online or in our UK stores so they can choose something they really want or need!